Arthplus capsules, is a powerful combination of herbs formulated to remove toxins around the joints and supports healthy and comfortable movement. It alleviates aches and pains within few days. 1. 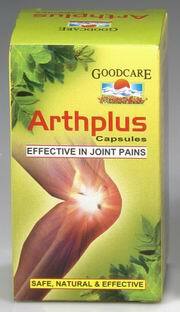 Very effective in joint pains, arthritis and gout. 6. Removes excess vata from the joints, nerves and muscles. 7. No side effects thus no ulcers. Yogaraja Guggulu, Singhanad Guggulu, Sudh Kuchla (Strychnos nuxvomica), Shallaki (Boswella sarrata), Nirgundi (Vitex nirgundo), Methi (Trigonella foenum – graecum), Balamool (Sida cordifolia), Erand Mool (Ricinus communis). Explore more Goodcare Pharma products.